Over the last years, enterprise applications have turned into a crucial part of a lot of businesses. Also, unlike ‘back in the days’ a lot of companies now opt for their very own, customized enterprise apps, as they can be developed at significantly better prices. But let’s not forget one aspect: these applications need to somehow integrate a big array of technologies, as well as infrastructure and devices, not to mention delivering a seamless experience, to a large category of users. So, what are these enterprise applications we’re talking about? Simply put, this is a term describing a software platform used by a business in order to help themselves with solving enterprise problems, but also carry out some of their functioning tasks, encountered day by day. As mentioned above, in the past, just the largest of companies were using this type of application, as they were, after all, very complex and costly to build. Still, technology kept evolving and enterprise apps are now used by more and more businesses, whether small, medium, or large, increasing their efficiency and profitability. Sounds like a pretty solid argument, don’t you think? .NET is, at the core, an open-source platform, with one of the largest class libraries when it comes to coding languages, allowing developers to use it accordingly. As a bonus, it integrates very well with pretty much all databases, as well as a set of tools which developers can find of great use. Easy to maintain? You got it! .NET functions on object-oriented programming, thus eliminating all the unnecessary code, not to mention that it involves a bit less coding from developers. To be more specific, it consists of code which can be reused, as well as many reusable components. In a nutshell, it’s incredibly easy to make changes to the program. There’s no doubt that when it comes to enterprise apps, security is one of the most important aspects. Thanks to features like character validations, the ability to check code, encryptions, as well as code access security, .NET provides an additional layer of security for applications. When .NET was built, its makers wanted to make it scale easily with the entire set of requirements of a program. Whether we’re talking about doing it both vertically and horizontally, in order to satisfy the needs of an enterprise, it can be very easy to scale .NET programs. As a bonus, using app extensions, you won’t be required to put more money in software, as soon as your business starts growing. And this can be considered a pretty good advantage, don’t you think? If there’s a must-have feature of enterprise applications, that is compatibility. But when it comes to .NET application development, both apps and software built using it can be used on multiple devices, seamlessly. Whether we’re talking about cross-device and platform compatibility, as well as toll improvisations and modularization, they all help .NET become compatible with pretty much any platform and language out there. For us, these are some of the most important – or essential, if you want – features of the almighty ASP.NET framework. Focused on performance and with a load of features, it’s also backed by a tech giant – Microsoft. 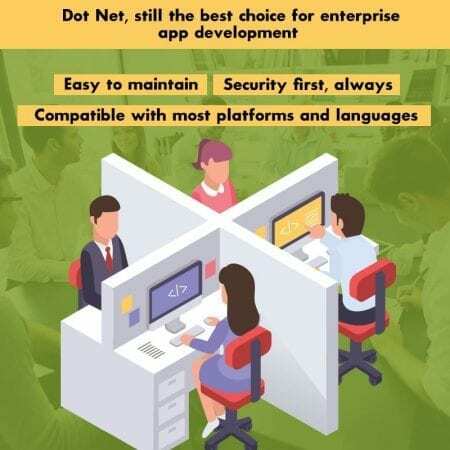 Even though we’re convinced that there are a few more benefits we forgot to mention, we can say that .NET is by far one of the most popular technologies used today by enterprises. Looking forward to developing your own enterprise application? IB Systems USA’s team of software developers has over 20 years of experience in software development, including the .NET framework, among many others. Whether you’re after a custom solution, made from scratch, or already have the basis, just get in touch with the team and all your questions will be answered!